This morning I dropped off a computer we bought for a kid at Georgetown. He is sick. 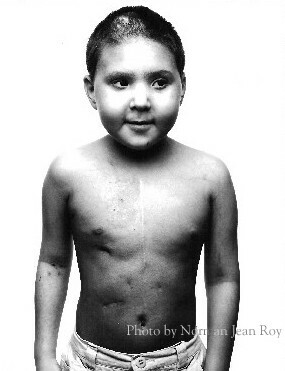 His mom, sister and aunt have all died from the same thing he has. He really wanted a computer. Hopefully this will help him some how. I was helping Joe get dressed this morning and I remembered something you used to like a lot. You loved the pants with the legs that zipped on and zipped off at the knees to make shorts. Joe, like Jack, is really picky about his clothes. I was trying to convince Joe to wear a pair of soccer shorts that you got from Nana who bought them when she took a trip to France. He asked where they came from. I said that they used to be yours thinking that would make him want to wear them. He said that they weren't yours -- they were his. He wore them. He looks cute. This little guy died of Fanconi on Saturday morning. 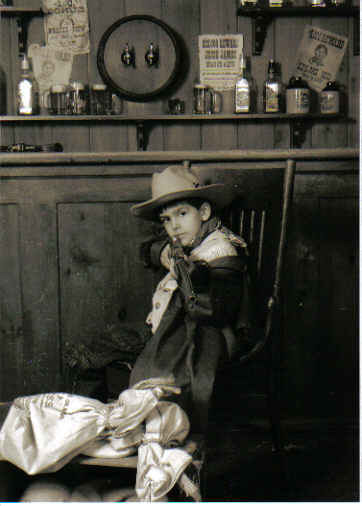 He was just about the same age as you were when you died. Mauri Pioppi, whose LoveLetters line of jewelry is popular among Hollywood celebrities, on Monday evening unveiled her latest creation: the "Live Well Laugh Hard" necklace. 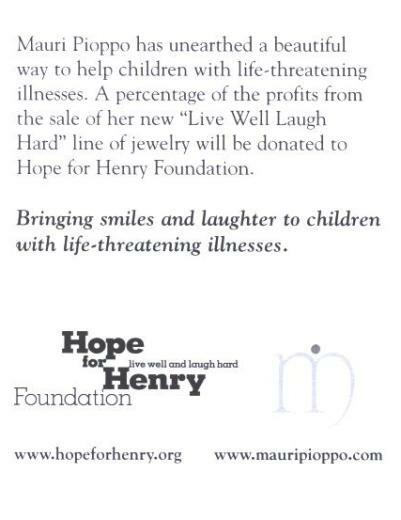 Sales will benefit the Washington, D.C.-based Hope for Henry Foundation. D.C. residents Allen Goldberg and Laurie Strongin began the foundation following the 2002 death of their 7-year-old son, Henry, who died of Fanconi anemia, a genetic disease, one type of which occurs more frequently in Jews of Ashkenazic ancestry.
" 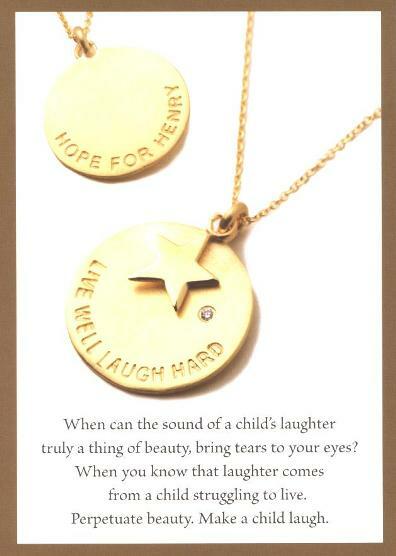 'Live Well Laugh Hard,' the motto of the Hope for Henry Foundation, is something we can all learn from and a beautiful sentiment to communicate on this jewelry," said Pioppo. "I am proud to lend my creative efforts to support the well-being of these children facing life-threatening illnesses. I can measure the success of this line in the smiles and laughter we all help bring to the kids." The foundation works with hospitals across the country to give high-end portable consumer electronics, like iPods, DVD players and XM satellite radios, to kids with life-threatening illnesses to help ease the monotony and pain of hospitalizations and medical treatments. Every ballpark seems smaller, every room brighter, every worry lighter when you're in the company of David Americo Ortiz, the friendly galoot of a designated hitter for the eternally grateful Boston Red Sox. In girth and mirth Ortiz evokes Babe Ruth, Santa Claus and your favorite stuffed animal from childhood. The only son of Enrique and Angela Rosa Ortiz -- "I'm my mom's baby boy, you know?" he says proudly -- grew up loved in Santo Domingo, D.R., and seems intent on loving the world back. Runyon or Twain might have invented a character like Ortiz, if it were possible for even such expansive imaginations to conjure a 230-pound teddy bear who speaks like a California surfer with a thick Spanish accent; a Dominican who married a Wisconsin girl and has wintered part time in the state; a hip-hop, bling-covered fashion plate who underneath his cool threads wears black boxer shorts with who's your daddy? printed in all directions in Day-Glo colors; and -- most amazing of all -- one of the game's great sluggers, who, at 27, was released by the Minnesota Twins after no other major league club wanted him in a trade. Ortiz, now 30, ranked fourth in the American League in home runs (18) and first in RBIs (56) at week's end, a pace that would leave him with 48 homers and 149 RBIs for the season and a three-year run in which he had no fewer than 41 homers and 139 RBIs. Only two players in history maintained such high production for three consecutive seasons: Ken Griffey Jr. (1996 through '98) and Ruth, who did so for six straight years (1926 through '31). A .300 hitter last season, Ortiz was batting .265, blaming the drop partly on the extreme defensive shifts employed against him. In Ortiz there is a little bit of something for everyone to like, which helps explain why he received more All-Star votes from major league fans than any other player last year; why his Boston Red Sox teammates, in one of the more respectful acts in clubhouse culture, ceded him total control of the stereo; and why a terminally ill eight-year-old boy, given days to live, asked to visit Fenway Park to meet him in April. 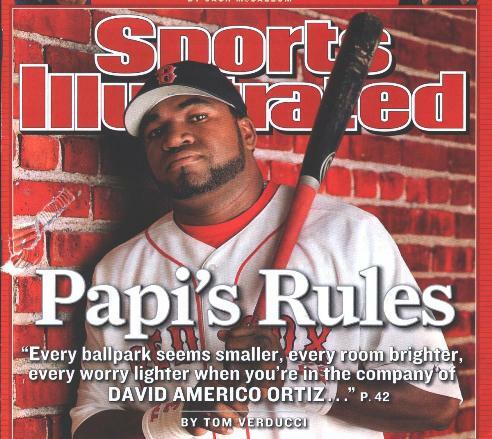 Ortiz's popularity, like his gap-toothed, omnipresent smile, crosses cultures and generations. "He appeals to every demographic," Red Sox general manager Theo Epstein says. "People love watching athletes who you can tell enjoy what they're doing. And to have a guy who comes to work every day with a smile -- that's especially huge in our clubhouse, where we had problems in the past." Says Puerto Rican-born teammate Alex Cora, "People love to be around David. The unique thing about him is that he communicates just as easily with the American players as with the Latin players. Most of the Latin stars don't have that quality. He brings the team together." Ortiz thrives on such interaction, preferring to spend as much time as possible around friends and family. Yes, he is outgoing by nature, but the company also keeps him from the dark thoughts that plague him sometimes when he is alone. Behind the smile there is pain. "I start thinking about life after death," Ortiz says. "I've got to quit thinking about it because it's very deep. Very deep. Sometimes you start thinking about it, and you don't feel like you want to be alive, so I don't like to get all quiet. "Everybody goes through some tough times in their life, no matter what you do. Man, I've had my tough times." Eight minutes. Ortiz remembers it as exactly eight minutes. It is all the time needed for an elite runner to cover two miles, for an orchestra to play the second movement of Brahms's Symphony No. 1 or, as Ortiz found out, for your heart to break. On New Year's Day 2002, it was eight minutes from that awful phone call from his sister's boyfriend -- Your mom has been in an accident -- to the time Ortiz arrived at the roadside wreck near his home in Santo Domingo. A dump truck. His mom's car. And Angela Rosa ... gone. "I was there eight minutes after it happened, and she was dead already," Ortiz says. "That's why I don't worry about baseball. I don't feel like I put any pressure on myself when I'm playing baseball. Not after that." 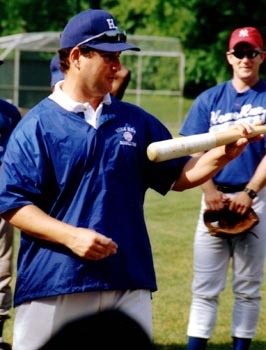 Ortiz was 26 years old at the time and still trying to establish himself as an every-day player with the Twins, who had plucked him from the Seattle Mariners' farm system in 1996, in one of those pennant-race deadline deals in which the anxious Mariners wanted veteran third baseman Dave Hollins. At the end of the '97 season Ortiz was promoted to the big leagues, and the first person he called was, of course, Angela Rosa. She and Enrique, whom everyone calls Leo, were always there for him. There was the day Leo, who sold auto parts, left work to watch his boy play Little League for the first time. David smacked a home run, and as he rounded third, Leo bolted from the stands and interrupted his son's trot to home by throwing a big hug around him. 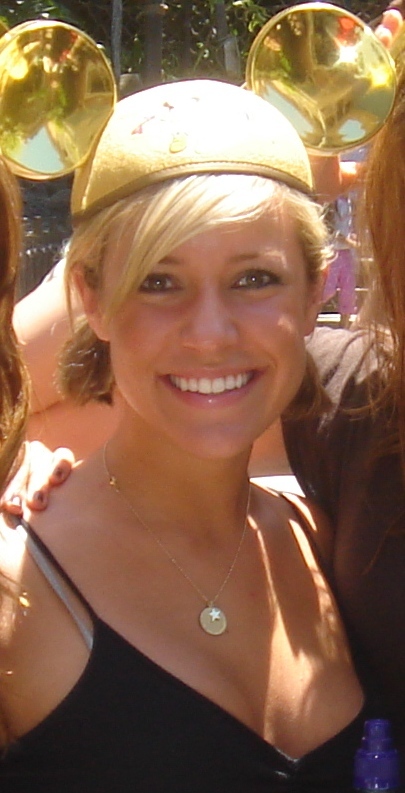 Though David still visits Leo regularly in Santo Domingo, things will never be the same without Angela Rose. "She was one of the best mothers ever," Ortiz says. "She was pretty much my everything. It's tough, man. I come from a poor family, but I had a good education and a good home. That counts for everything. My mom, she wasn't like a baseball mother who knew everything about the game. She just wanted me to be happy with what I was doing." Both his parents, Ortiz says, stressed the importance of education, but it was Leo, a former semi-pro ballplayer, who advised David to give up his other love, basketball, to concentrate on baseball. It was baseball that brought Ortiz to Wisconsin in 1996, where, while playing Class A ball at age 20, he met his wife, Tiffany, and started a family that includes two daughters, Jessica, 9, and Alexandra, 5, and a son, D'Angelo, 1 1/2. The year that began with his mother's death, 2002, would also be Ortiz's last with the Twins. He hit .272 with 20 home runs and 75 RBIs platooning at first base for a young team that reached the AL Championship Series. Minnesota, though, was not high on Ortiz, who seemed injury-prone (he missed chunks of time with wrist and knee injuries), was not a polished fielder and couldn't catch up with good fastballs on his hands. Minnesota G.M. Terry Ryan figured that Ortiz's development had stalled and decided to trade him. "He just wasn't getting it done here, for whatever reason," Ryan says. Then he admits, "I made a bad baseball decision." He wasn't alone. Ryan tried to trade Ortiz for two months. "Not one team made an offer," Ryan says. "Nothing." Finally, in December 2002, the Twins released Ortiz. Finding a job at that point of the off-season looked so difficult to him that he told his agents, Fernando Cuza and Diego Benz, to check for openings in Japan and Mexico. "[The Twins] did me that bad," Ortiz says. "I never had a problem with anybody in that organization. Ever, bro. I was a good teammate. I respect everybody. I never had no argument with no coach, nobody. I never did anything wrong, but they did me wrong. No respect, bro. I was lucky I got a job with the Red Sox. There were other teams, but they were offering me way less money." The Red Sox gave him $1.25 million and figured he was one of five guys -- along with Jeremy Giambi, Shea Hillenbrand, Kevin Millar and Bill Mueller -- who would combine to fill three spots (first, third and DH). Six weeks into the season Ortiz showed so little power (two homers) that his teammates were calling him Juan Pierre (the light-hitting leadoff man who's now with the Chicago Cubs). Ortiz wanted out of Boston. "I called my agents," he recalls, "and said, 'If you guys are not here tomorrow, you guys are fired.'" After the next day's game Ortiz and his agents met with Epstein in the players' parking lot outside Fenway Park. "I told Theo, 'I want you to trade me or release me,'" Ortiz says. "'I can't be sitting here watching this circus anymore, guys I know I can do better than. Me just watching from the bench? I'm not that kind of guy. I don't clap for something that doesn't deserve it.'" "Give me a couple of days," Epstein recalls saying. "I promise you we've got something in the works to free up a spot for you." On May 29, 2003, Epstein traded Hillenbrand to the Arizona Diamondbacks for righthander Byung-Hyun Kim, a forgettable trade for Boston except for the opportunity it gave Ortiz. Finally, he could smile. Ortiz had felt stifled in Minnesota, an organization that so emphasizes situational hitting that no Twin has hit 30 home runs in a season since 1987. The 6'4" Ortiz was the square peg who didn't fit in the round hole. "They wanted me to stay inside the ball," Ortiz says, referring to a style in which a lefthanded hitter tries to hit inside pitches to leftfield. "They were teaching that to everyone. That's why nobody ever hits home runs there. But when you're young in the big leagues and the coach tells you to do something and you don't do it and you get negative results, then you're f-----. They're going to sit you down." The Twins, Ortiz says, so enthusiastically stressed small-ball tactics such as hitting behind runners that "if you moved the runner over from second base [with a groundout], you got high fives in the dugout like you just hit a home run." In his first at bat with the Red Sox, while batting cleanup in a spring training game, Ortiz happened to come up with a runner on second base and no outs. "I came in with that little pull, cheap-shot s---," said Ortiz, explaining his grounder to second base on an outside sinker. "I still had the Minnesota Twins in my system." This time there were no high fives waiting for him in the dugout, just manager Grady Little with a word of advice. "Hey," Little said. "Next time? Bring him in." Ortiz smiles at the memory. "I was like, O.K.!" he says. "I had a little more freedom than what I was used to." Says Epstein, "We didn't know what we were getting. Nobody knew. We just let him be exactly what he is." Ortiz, with a mechanical tune-up from hitting coach Ron Jackson, and freed of the wear and tear of playing in the field, started turning on inside pitches and closing that hole in his swing on inside fastballs. From June 1, 2003, through June 1, 2006, he slammed 132 home runs, second only to Albert Pujols's 140 in the majors. He finished fifth, fourth and second in AL MVP balloting in the past three seasons while conjuring up so much late-inning magic -- he has 13 walk-off hits with the Red Sox, including three in Boston's 2004 postseason run to a world championship -- that last year the team presented him with a plaque declaring him the greatest clutch hitter in the history of the boston red sox. Ortiz lived up to that billing on Sunday, hitting a three-run walkoff homer at Fenway to beat the Texas Rangers 5-4. "He loves coming up in the big spot," says Epstein, whom Ortiz has persuaded to junk the sabermetrics principle that clutch hitting is not a skill. "He makes you rethink the objective analysis. The way he rises to the occasion and the quality of his at bats, the numbers don't reflect that human element." Says Ortiz, "It's mostly confidence. If you go up there thinking you might not get it done, you're out already. I know I'm going to hit you. And I have confidence all around me here. In Minnesota, if we faced a good pitcher, guys would say, 'Oh, well, I'll get my hits tomorrow.' Here? We don't care who's pitching." Ortiz's transformation from released player to, as Toronto Blue Jays G.M. J.P. Ricciardi says, "a Hall of Famer with five more years like this" may be unprecedented. The Brooklyn Dodgers lost Roberto Clemente to the Pittsburgh Pirates in the mid-1950s version of the Rule 5 draft, but no other hitter this good has ever been willingly cut loose. The Red Sox this spring signed the former castoff to a four-year, $52 million extension, keeping him in Boston through 2010. It's just another reason why Big Papi is smiling. "I'm not going to lie, I got frustrated a lot before [Boston]," Ortiz says. "It's been tough. The worst was losing my mom. 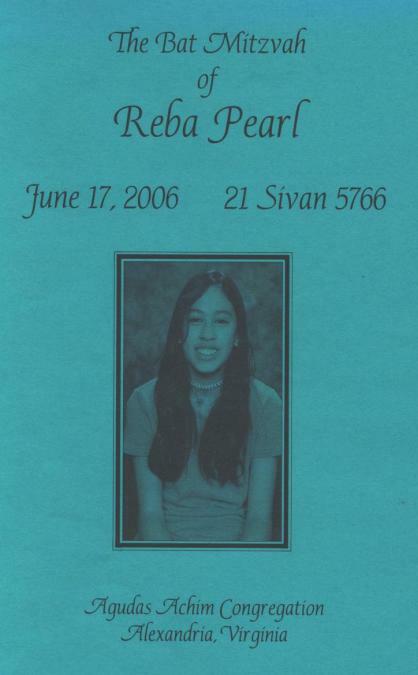 Losing her was something I couldn't figure out at the time. I was, like, lost and confused. "When things weren't going good, she would always say, 'Son, you're always going to be my baby boy. Keep fighting. I love you.' Now, even though I don't have that voice, I feel that spirit to fight back when times are tough. My mom, she's still always there for me. Always." We went with Papa Teddy and Jeri to go see the Nationals play the Yankees. I am sure that Papa Teddy, growing up watching the Brooklyn Dodgers, is no fan of the Yankees. Jack and Joe were very excited about seeing Alex Rodriguez, Johnny Damon and Derek Jeter. It was about 100 degrees out and no breeze. A lot of that is Joe's sweat and a little of it is water that we were pouring over his head to keep him cool. It was hard for everyone but me. I didn't mind the sun. I was just very psyched just to have everyone together and be at a ballgame for Father's Day. And to make it an absolutely perfect day, the Nationals won on a walk-off home run in the bottom of the ninth inning. Wow. I didn't get sad thinking about you. Mom said I wasn't in the best mood, and I wasn't admitting to being upset. I did get sad on Monday, though. I picked up our mail when I walked into the house. 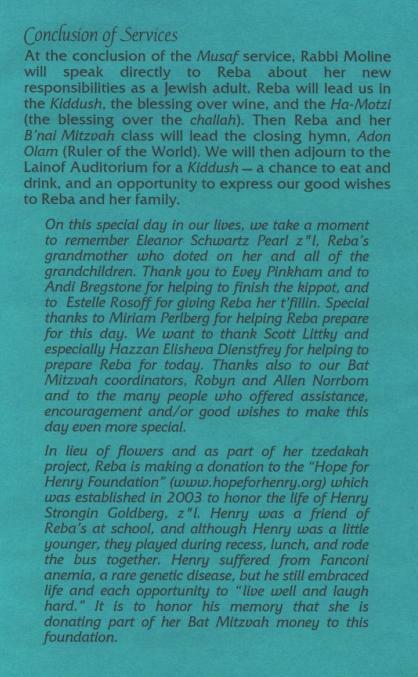 There was a small envelope from Chai Lifeline. That is a group that sends everyone something on important days... Jack and Joe get something on Hannukah, Mom gets something on Mother's Day, and I got a "World's Best Dad" refrigerator magnet for Father's Day. Seeing that just killed me. It just took a day, that's all. Joe is at Home Run Baseball Camp. The camp is run by Coach Mac. He is a good guy. You would have liked going to this camp. 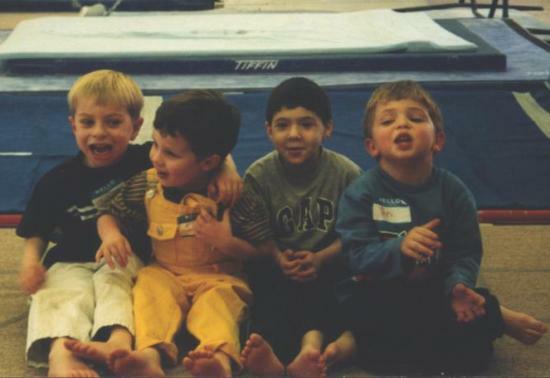 Jake Mintz has been going forever. He'll be a coach there someday. The other day something unusual happened. Joe and I went over to Stoddert for me to pitch to him. I outlasted him! After he hit about 100 pitches he said he had enough and wanted to go home. I cannot remember him ever wanting to call it a day before I did. Joe wears wristbands all the time. He looks very sporty. A real pro. Today was Jack's last day of school. Mom and I talked about how hard it will be when your class graduates. Jake goes next year 'cause he skipped a grade. Ari will be on time with the rest of your class. Too bad Simon doesn't go to JPDS. We sat through the assembly and it was nice to see some of your friends up on the stage. Elan, who used to be your reading buddy and who taught you about the Beatles, made some funny remarks as he remembered his years at JPDS. I wonder where he is going to school next year. When we left sixth grade we just showed up for a half day of school, did nothing, and then took the bus home. I don't know if that is still what happens at public school. Everything is so showy and more complicated these days. I took a second to visit with you on my way out the door to go back to work. Jill's sister Mauri made a necklace for us to raise money for Hope for Henry Foundation. We had a party so people could come and buy the necklace. When Jill saw Joe she said he looks just like you. Rich told me they don't have any Rollo's in their house anymore. They must have been buying them just for you. I wrote that thing on the postcard. Not sure exactly what it means. I just think it is important that kids have smiles. Even when you are really sick you can still smile. You did. It just means we have to work even harder to get the smile. We have some friends helping us get the word out about the necklace. A woman who was on TV and is now in movies just wore it at Disneyland. Cool ears, huh. We are going to the Nationals v. Yankees tomorrow. It should be a good game. The Yankees beat the Nationals last night, and Mom and Jack and I are watching them play on TV right now. I am worried that there will be more Yankees than Nationals fans in the crowd at RFK. I can't stand it when that happens when the Redskins play the Giants or the Cowboys. There might not be more of those fans - they are just a bit louder than us. 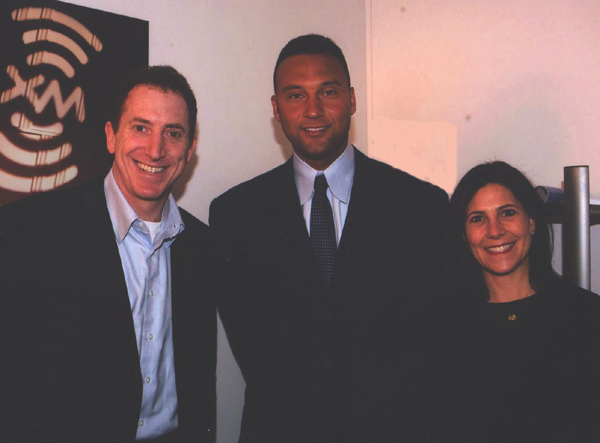 This is Mom and me with Derek Jeter earlier this year. I wonder why so many famous people want to meet us. I am afraid that Jack will be one of the people cheering loudly for the Yankees. I wish he'd like the Nationals. I was a Senators fan when I was Jack's age, and then all of a sudden they were gone. I wasn't lucky enough to have a home team to cheer for growing up. Jack is. I hope he comes around. I was on the elevator with this guy who is kinda the wise old man around here. He was telling me that when he was 17 he read that Thomas Jefferson only slept 4 hours a night. He said that he has only slept 4 hours a night since he was 18. He's gotta be in his 60s now. I was thinking the other day that you are not in my dreams anymore. I really wish you'd visit me more often. After I spoke to that guy yesterday I realized that maybe I haven't been giving you much of a chance. I get up at 5 am every morning. Not because I have to or want to, just because I do. I used to go to bed super early but that wasn't good 'cause I was never awake to talk to Mom after we got through putting Jack and Joe to bed. So about a month ago we bought a ginormous TV so I'd stay downstairs and awake. Now we hang out together in front of the TV watching a bit, working on our computers, and sometimes just talking. Now I go to sleep real late and still wake up early. Not a whole lot of time for dreaming. That's not a good thing. I did have one dream recently that I can remember. I rode a bike across a huge busy bridge and ended up high on a cliff in someplace that seemed like Toronto. I haven't a clue what that all means. It is Father's Day this weekend. Probably my least favorite holiday. I get sad. I got us tickets to go see the Nationals play the Yankees. We are going to take Papa Teddy and Jeri. I am really psyched to go to the game. I wonder if they'll let everyone down on the field at RFK for a catch the way they do at Fenway. That would be very sweet. Papa Teddy sold the place where he and Grandma used to live. He lives with Jeri now in a house they bought together. To be honest with you I am a little scared to go there. I think I will have to really think a lot about Grandma being gone. I went to Joe's end of the school year picnic last week. What was great was that it was down the block at Guy Mason. Scudi was there. The last time I was there with her was when you were alive and she was taking care of Jack and Nicky Picky and you. She knew exactly where the brick was that we bought that has you and Jack on it. Joe is doing baseball camp for a couple of weeks and then he goes to Beauvior. It will be interesting to take him there. I will definitely visit with the nurse. She loved you. Jack's school ends on Friday. He is going to camp at Sidwell Friends and then he is off to sleep away camp for a month. Mom and Jack and Joe and I went to see the new Pixar movie - those are the guys who made Toy Story and Monsters, Inc. - this weekend. 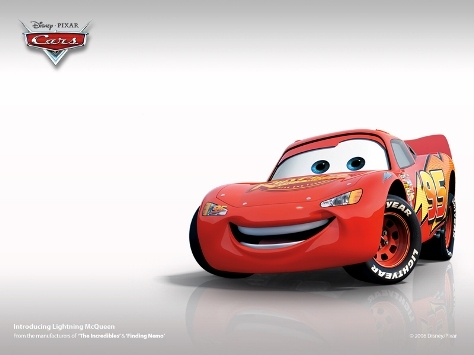 It is called Cars. I was talking to someone who I work with who saw the movie this weekend with his little boy. My friend said that he got a little choked up at the end, which was made to tug at your heartstrings. What I didn't say was that I got choked up too. But I got choked up at the very beginning when I saw this just before the movie started. Disney first used this for the opening of Toy Story. Whenever I see this image and hear the music that goes with it I think about the countless times you and I sat and watched Buzz and Woody. 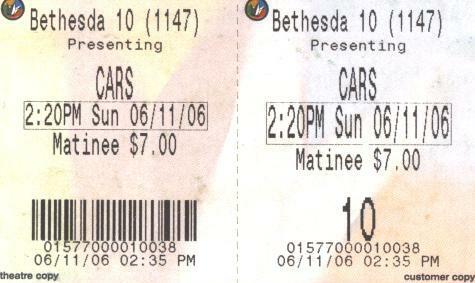 It took me a while to recover, but Cars was beautiful and fun. It was kinda slow at times and Joe was getting really fidgety, but the ending was exciting. After the movie finished they included a spoof of Toy Story in the credits. The cars are watching a movie called "Toy Car Story." It was very funny.